The urge to Argyle is strong, so I’m going with it. The up-side of having a fairly robust stash is that when you need to get something started quick, there are usually yarn options at hand! For this particular venture, I selected some leftover Crazy Zauberball, and coordinated with a couple of neutrals. I cast on and got started argyling! 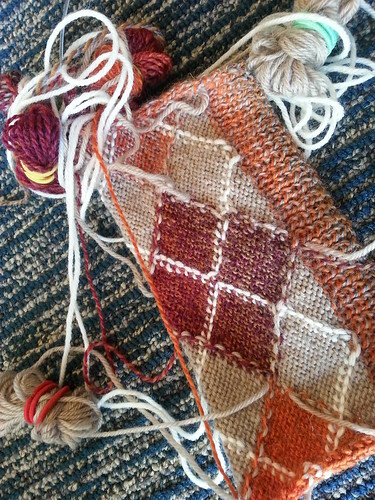 Intarsia is a little fussy because of all the strands that tend to get tangled up as you interlock them going back and forth, but I think the result is going to be worth it. Thanks Donna. 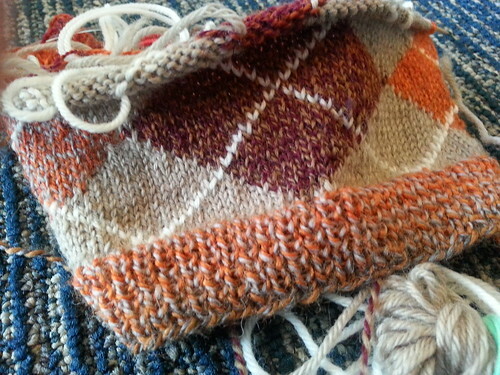 Argyle socks have been on my “must knit” list for a long time. Can’t wait to wear them!